July 2018 | Chinook Mergers, Acquisitions and Business Brokerage Ltd.
For example, according to research by ValueBuilderSystem.com, a company with $200,000 in EBITDA might be lucky to fetch three times EBITDA, or $600,000. A company with a million dollars in EBITDA would likely command at least five times that figure, or $5 million. So the company with $1 million in EBITDA is five times bigger than the $200,000 company, but almost 10times more valuable. More often than not, an acquiring company is between 5 and 20 times the size of the target company. Private Equity Groups (PEGs) make up a large chunk of the acquirers in the mid-market. 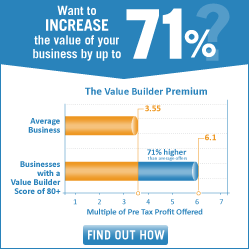 The value of your company will move up considerably if you’re able to get a few PEGs interested in buying your business. But most PEGs are looking for companies with at least $1 million in EBITDA. The million-dollar cut-off is somewhat arbitrary but very common. As with homebuyers who narrow their house search to houses that fit within a price range, or colleges that look for a minimum SAT score, if you don’t fit the minimum criteria, you may not be considered.